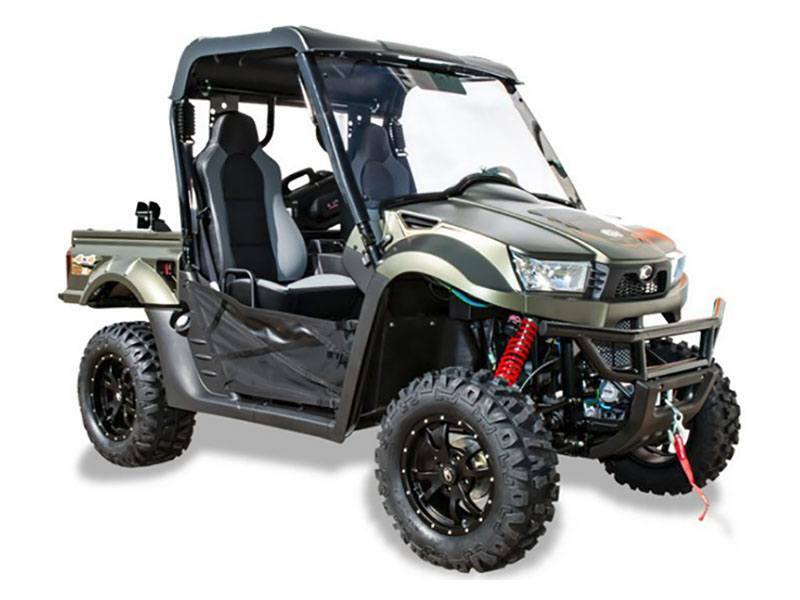 UXV 700i Hunter is a sportsman’s full-featured side by side, with the added specialized standard features: black aluminum alloy 14 in. wheels; 26 in. tires; 3,000 lb. NuJet winch; hard top; windshield; bed extender; and gun boot/mount. Based on the revised 2018-version of the UXV 700i line of UTVs, the UXV 700i Hunter also has: 695cc fuel-injected engine; push-button, on-demand 2WD/4WD, automatic CVT transmission with H-L-N-R-P drive modes and differential lock; independent dual A-arm suspension; hydraulic dual-disc front and shaft-mounted rear hydraulic disc brakes; 440-lb.-capacity hydraulic tilting cargo bed; 1,200-lb. towing capacity; two-inch receiver hitch; locking glove box; under-seat and dry under-hood storage; digital instrument display; 12V accessory outlet; beverage holders; electronic power steering (EPS), 2 in. receiver.